Contractors for the North Dakota Department of Transportation (NDDOT) Fargo District and City of Fargo 10th Street North road reconstruction and infrastructure improvement project are close to completing one of the intersection improvements. Starting the week of July 16, 10th Street North the next phase of intersection work will begin changing access for drivers on the north portion of the work zone. Crews are working in the 700 and 1000 blocks of the 10th Street N reconstruction project on underground utilities while paving operations continue between 8th – 10th Avenues. Crews also continue work under the railroad underpass on the new lift station. 10th Street North between 4th – 11th Avenues is not accessible to drivers. Local-traffic only is maintained in the blocks between 11th – 12th Avenues where crews have not started breaking up existing roadway. 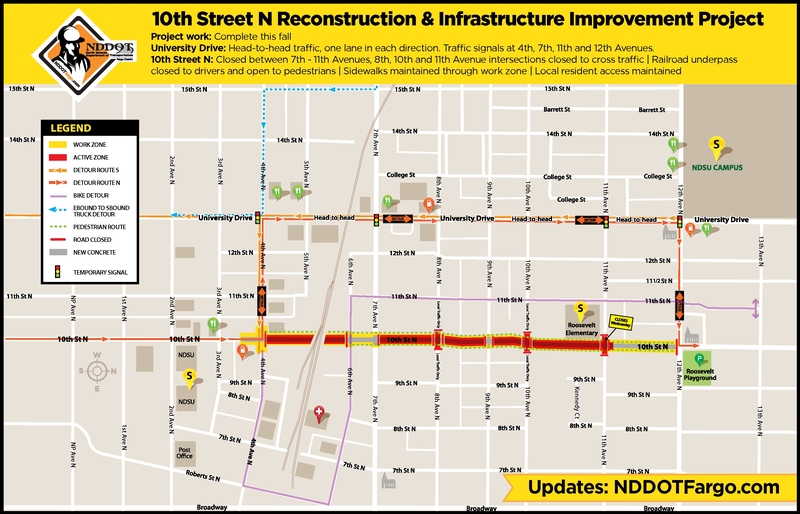 Visit NDDOT Fargo District Facebook post to view the drive for northbound 10th Street N traffic carried on University Drive.